This is a new one, for me. I like the occasional oddity. 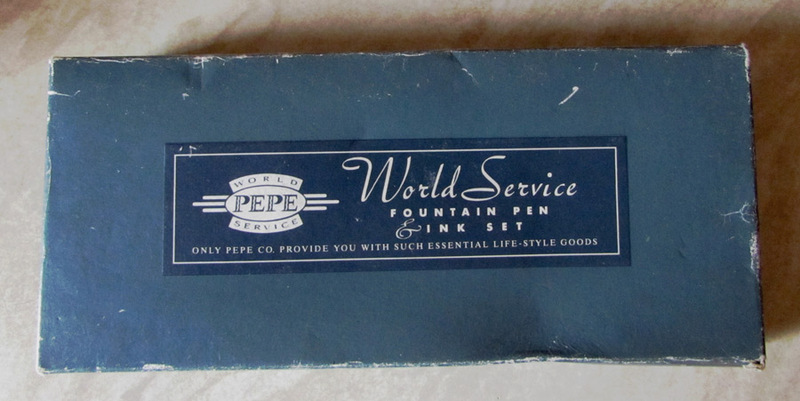 Pepe World Service, as you may know (I didn’t) is a designer label, marketing jeans, T-shirts and other clothes. It apparently does some accessories, too, and that’s where this fountain pen comes in. I have no idea when this was made but I would guess it’s no older at the most than the 1990s. As you can see, the box contains a pen and a bottle of ink with an eyedropper attachment. I’m not quite sure why anybody would go for an eyedropper filler in a pen that is marketed to the general public. It’s a big pen at 15.4 cm capped. It’s surprisingly well-made. The plastic, in grey/black marbled effect is not unattractive and it has an ink view area which is quite useful in an eyedropper pen, giving you the opportunity to refill before it starts to blob. It has a strong clip and the very wide cap band has a “stacked coins” effect. There is a silvered barrel imprint. 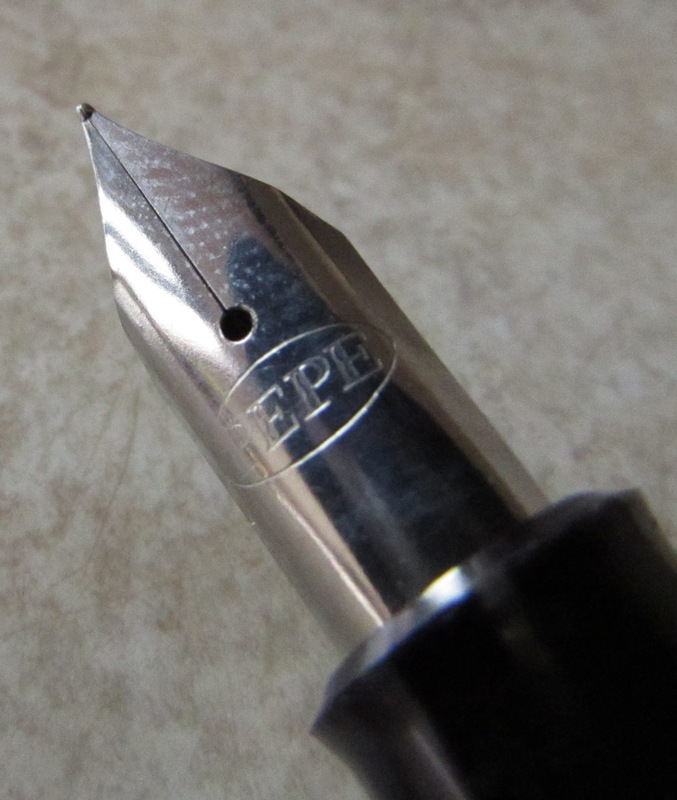 The firm fine steel nib is marked “Pepe”. In all, it appears to be quite a good pen. It would be nice to know who it was made by but I don’t suppose we will ever get that information. This looks like some Indian eyedroppers I have, particularly the very wide cap band. Wonder if it is a rebadged Oliver or perhaps Airmail/Wality? It might well be. I’m not familiar with the whole Wality and Airmail range. I did have a very large Wality eyedropper some years ago but I can’t remember what the nib was like. Yes, looks very much like a Wality 58. That might well be what it it is. Pepe sourced their clothing products extensively (and almost exclusively) at this time in both India and Hong Kong (China). The World Service logo was phased out in the early 90’s, around 93.